To migrate record owner information, the DMM expects each entity records file to have a column, the data in which can be used to uniquely identify the owner for the records. DMM also expects the details of all users in the source system to be available in a separate file. The following is an example of an entity data file(Account.csv) having owner information in one of its columns(Owner), a file with owner information (owner.csv) and representation of the relationship between them and that with MSCRM. 1. Map the column having owner information in your source entity file to Owner field of corresponding entity in MSCRM. In the above example, Owner column of Account.csv file will be mapped to Owner field of MSCRM Account entity. 3. Here on, there are two ways in which you can establish relationship between records in Users.csv file and MSCRM users. a. 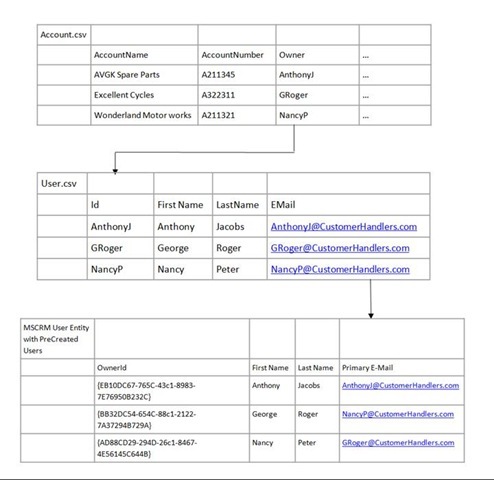 One way is to have DMM AutoMap the individual source users to target CRM users using the relationship between the user.csv file and your MSCRM users as shown in the above data (The above data has EMail column data in User.csv exactly same as “Primary E-Mail” of MSCRM Users). b. 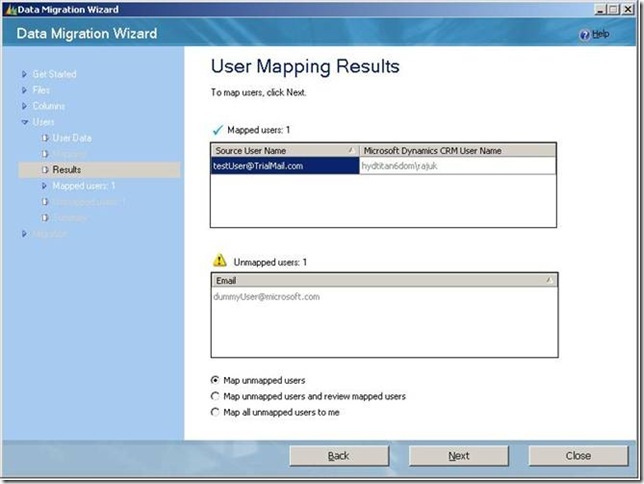 The second way is to manually map each user in Users.csv to a user in MSCRM manually. One good reason why you would do this is you do not have a relationship as shown above. DMM would need some additional information for mapping the source users to the Target MSCRM users. The following screen would request you to provide the same. 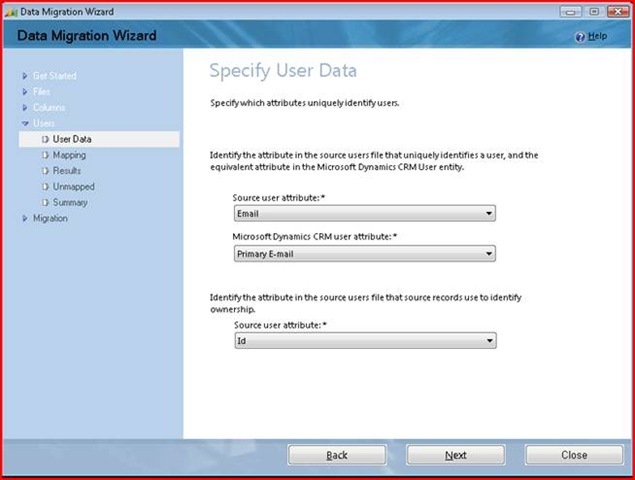 In the first section of the page, you identify which column in your source users file (Users.csv in this case) is used to uniquely identify a user in the Microsoft Dynamics CRM User entity. You are thus describing the relationship between Users.csv records and MSCRM users. This information is essential when we want DMM to perform auto map of users using the some common data that is present in the User.csv and MSCRM users. If you do not have any such specific common data between the source records and MSCRM users then select any values in these fields and proceed. 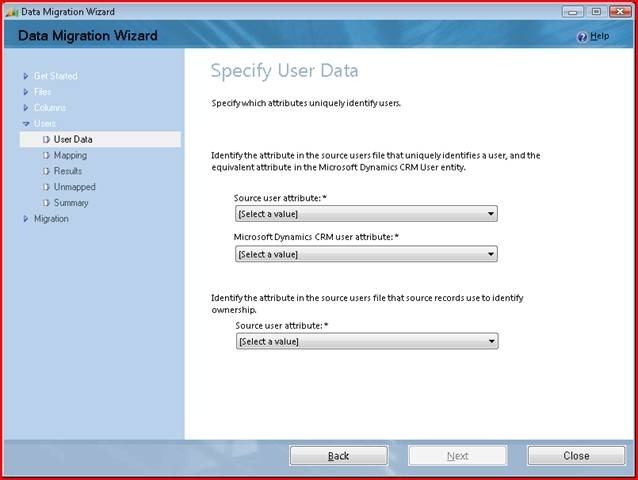 Source user attribute: This is the column in your Users.csv file that has same information as what is available in one of the attributes in MSCRM users. It is the ‘Email’ column in the above example. 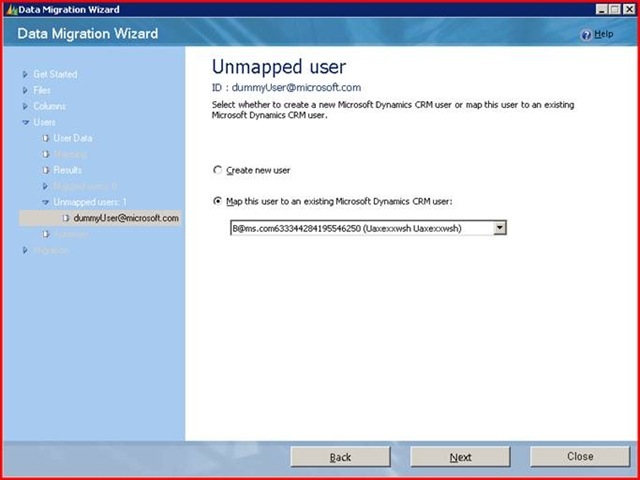 Microsoft Dynamics CRM user attribute: Select the attribute in your Microsoft Dynamics CRM User entity that the Source user attribute maps to and has the value same as that in Source user attribute. In the example above the Source User attribute has data which is same as Primary E-Mail Id in MSCRM user and that has unique values in it. In the second section of the page, you identify the column in your source Users file(Users.csv) that your other source files refer to in the ownership column(column mapped to Owner attribute). 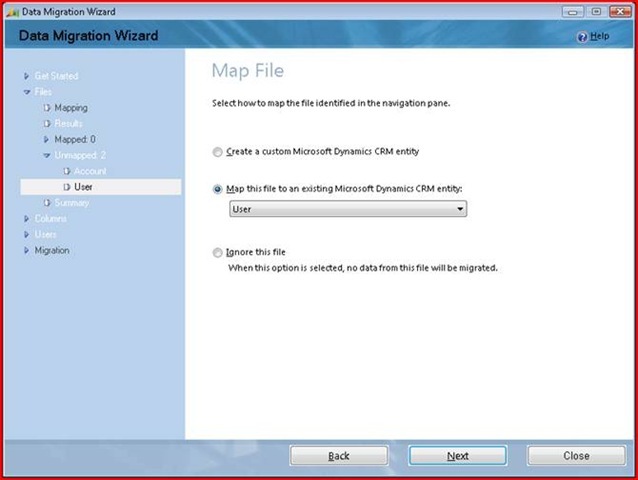 This information is essential irrespective of whether you want the DMM AutoMap to be performed or not. Source user attribute: This list will be populated with all the columns in your source Users.csv columns. In the above example the value to select will be the Id column. Following screenshot shows the mapping that would be done to map the above shown relationship. Note: For Auto mapping to work appropriately it is essential that you ensure that the 3 columns chosen above have unique values in each of the records. Following highlighted section is the entry created by DMW in the data map corresponding to the above mapping. The above effect can be added in the map that you import for usage in a migration by adding similar snippet in it. – – – truncated …. So what really happens in here is, for each record in User.csv file: DMM picks the value from that record for the column mentioned in Section 1, Dropdown 1 of above screen (Screenshot 7). Search for the value selected in the previous step in MSCRM User entity’s attribute specified in Section 1, Dropdown 2 above and chose that record. Map the user in User.csv file to the MSCRM user record selected in previous step. Here you can choose to map all users that could not be resolved by DMM to you or to map to someone else. This mapping would be added to the data map and used for record assignment. A valid concern here could be that this particular mapping is data mapping and your valuable data may get exposed if the Data Map is exported. To ensure that this does not happen, Data Map, when exported, will not have the mappings done on this screen. These mappings would thus be available for reuse only on the DMM instance where it was created but cannot be exported out and reused in some other instance. This is just to make sure your valuable data does not get leaked out even by way of data map export and distribution. The mappings made as shown in Screenshot 7 will be available for reuse in the Data Map exported. From here on you can use Next button to complete migration and the entity records would be migrated. The record ownerships would be assigned to users as per your mappings. Keep watching this space for more details on more advanced features of DMM which will enable you to perform much more powerful tasks during Migration.